Breaking up is hard to do, particularly when your hands, and soul, are tied behind your back by a higher power. 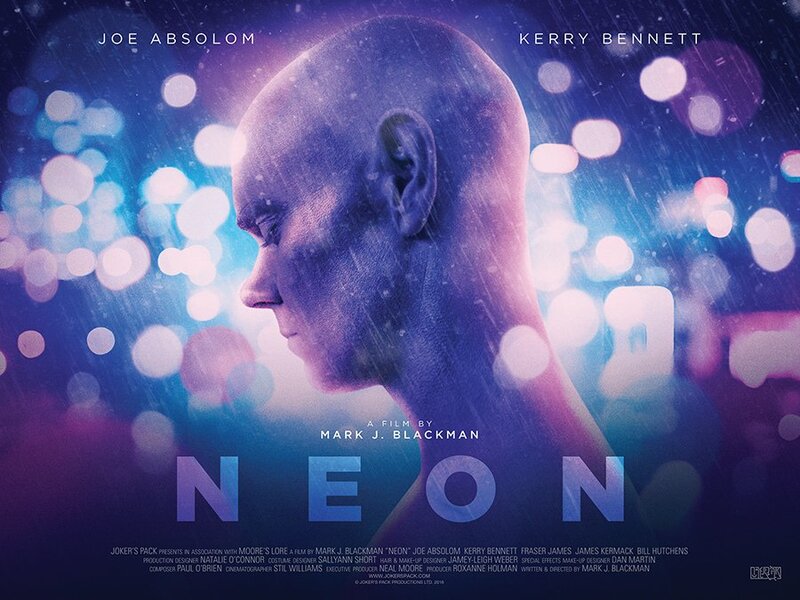 Neon is a visually impressive thriller from writer/director Mark J. Blackman, whose story, at its heart, is about the collateral damage of a relationship. In many ways it works as a companion piece to another of Blackman’s films, Animus, which dealt with aftermath and the impact of buried feeling. Feeling plays an important part in Neon. It opens on Mary (Kerry Bennett), as she receives a phone call from the person we assume she is involved with, Elias (Joe Absolom). However, this is no mere break-up, but something far deeper and strange. Elias has a back story, a tragic past and some extreme limitations that deny him the simple pleasures of falling in love. In short, guilt and regret play their part, in the way that they usually do in relationships. As the story progresses, however, the layers begin to peel back, and Neon takes on a more fantastical quality, a mixture of mythology and sci-fi that feels both modern and retro, and yet, despite its influences, manages to feel utterly fresh. From a purely technical point of view, Neon looks and sounds impeccable. The score, by Paul O’Brien, beats to a pulse that lends the narrative a compelling pace, married to some simply brilliant editing which recalls the best of Danny Boyle’s work, particularly the more expressively aesthetic films such as Trance. It complements the imagery with a real precision. That imagery, meanwhile, is courtesy of cinematographer Stil Williams, who pulls out all the stops to make a low budget short look more like Bruckheimer era Tony Scott. The blue glows and starkest whites feel alive, capturing the two sides of the story structure, in which darkness and light are forever bouncing off of each other. Just as alive are the films cast. As played by Absolom, Elias is a tortured soul, or a soulless wanderer depending on your interpretation of his character. Playing quiet anguish can be tricky, and to Absolom’s extreme credit, he never overplays the more fantastical elements of Elias’ nature, instead making his struggle more internal, the pain expressed mainly through his eyes and some sublime voice-over. You’ll certainly never watch Doc Martin in the same light again. If Absolom lends the film its ethereal quality, then Kerry Bennett brings it back down to Earth, her committed performance as Mary, both the object of Elias’ affection, and his inspiration to get out of the life he is leading, displaying a heavy range of emotion that, given the film runs 15 minutes in length, paints a portrait of a fully rounded character. This is often an Achilles in short work, performances contained within such a finite framework can often just coast or get lost entirely under style. The genius here is in how much the actors give. If the film has a flaw, it’s that there is a feature length story just screaming to get out of it, the screenplay ambitious enough in scope and romantic enough in its intent, to hint at something both far more action packed, but also far more heart wrenching. There is pain in these characters pasts, there are moments we yearn to see and a love story that wants to let us in to the intimate moments that a short film narrative simply doesn’t have the time to give. But if Neon’s worst aspect is that it leaves you wanting more, surely there are worse sins out there. Blackman has crafted something bold, slick and original, an engrossing calling card for a contemporary film maker who is just warming up.